Did you know that 2015 was predicted to be a mast year? According to Thomas Rainer, an East Coast garden designer and author, mast is the fruit of woody forest trees, such as oaks, walnuts, and hickory trees. The quantity of fruits or seeds produced by a specific tree varies year-by-year. 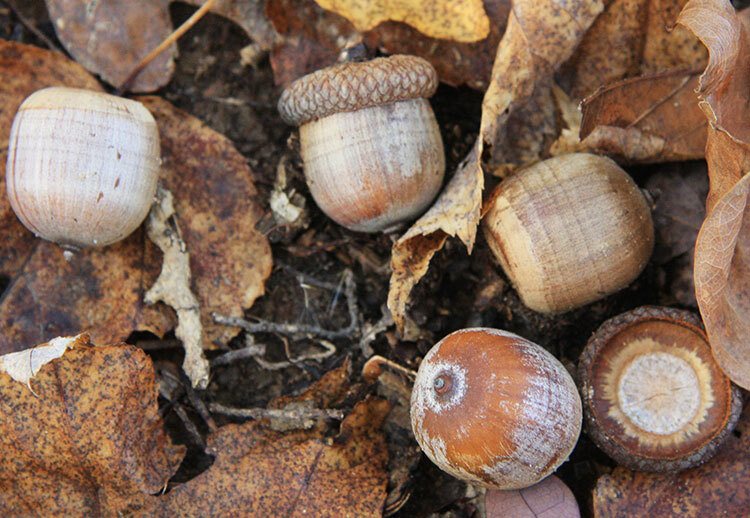 Oaks may produce only a handful of acorns one year, while producing hundreds of tiny bullet-shaped capsules the following year. The surplus or shortage of fruits has a direct effect on the ecosystem. Scientific studies have shown a direct correlation between years with a mast of acorns and a growth in deer populations that consume the hard-shelled fruits. Several theories also exist that attempt to explain the reasoning behind this natural phenomenon. Some scientists believe that trees produce an in ux of fruit to satisfy the fruit-eating mammals. Foraging squirrels, birds, and deer will consume only a portion of the acorns. Therefore, a greater quantity of acorns equals a greater potential for germination–a simple reproduction strategy carried through supply and demand. Others speculate that masting allows a tree to transition from periods of growth and reproduction. Producing seeds requires a great amount of energy. Masting allows a tree to shift its energy from owering and producing fruit one year to growing the following year. Rainer, Thomas. Mast Year. Grounded Design.